After weeks of leaked screenshots and teasers of the first Windows 8.1 update, a pre-release build has crept onto various file-sharing websites ahead of its official March launch. Initial reports from eager testers reveal that the Windows 8.1 Update 1 includes tweaks designed to simplify the OS for keyboard and mouse users. They include the ability to minimise, close or snap apps downloaded from the Microsoft Store using a pop-up bar that provides an alternative to Windows 8's gesture-driven charm menus. Additionally, the Start Screen now has an added context menu feature that lets users right-click apps to resize and unpin them, removing the need to click icons along the bottom of the screen, as well as other context-specific actions. To help save further time, search and shut down buttons have been placed onto the Windows 8.1 Start Screen. As reported in previous leaks, Windows 8 apps can be shown on the taskbar on desktop mode, but there is no mention of the OS booting straight to desktop, as recently-outed rumours alluded to. Windows 8.1 has also taken another baby step in global market share. It climbed above aged and ailing OS Windows Vista, raking in 4 per cent share, while its predecessor, Windows 8, sits at 6.63 per cent. However, even the combined share of the two pales in comparison the gargantuan 47.5 per cent that Windows 7 enjoys. Windows XP, doomed to end-of-life in April, actually gained market share in January this year. Despite the company's prophetic warnings for users to migrate as soon as possible, people are still picking up the 14-year old system. 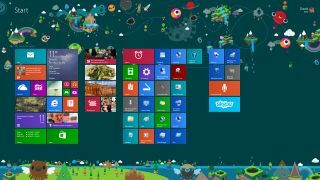 Microsoft is expected to release the final version of Windows 8.1 Update on March 11, ahead of the BUILD conference in April.